Palmyra girls lax ousted in district openerThe Palmyra girls lacrosse program has come a long way in recent years. So far, in fact, that the Cougars are now one of those programs that ends their season in the playoffs, not before them. Palmyra boys lax falls in Mid-Penn title gameHARRISBURG —Undefeated Palmyra was not preoccupied with its record. The Cougars’ sole intent in taking the field Thursday night at Central Dauphin Middle School was to win a Mid-Penn Conference championship. Five-goal rally lifts Palmyra lax past HersheyHERSHEY – If the Palmyra boys' lacrosse team was going to complete its perfect regular season, arch rival Hershey was going to make the Cougars earn it. 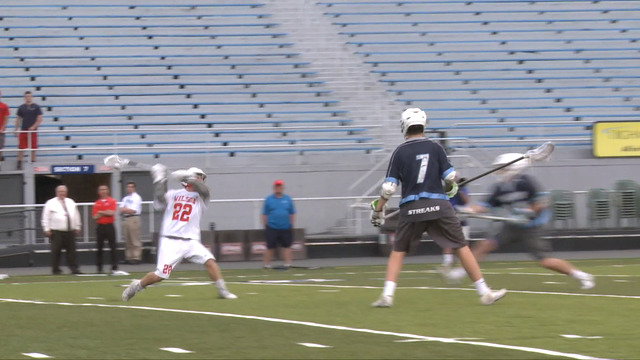 Watch: Palmyra boys lacrosse takes over GTPA SnapchatThe Palmyra boys lacrosse team locked in a come-from-behind victory over Hershey to clinch the division title and complete a perfect regular season. Watch: Central Dauphin at Palmyra top 5 playsSee the top five plays from the Cougars' 20-18 win over the Rams Tuesday. Watch: Conestoga Valley at Crest top 5 playsSee the top five plays as the Buckskins beat the Falcons 12-8 Thursday. Watch: Cumberland Valley at Palmyra top 5 playsSee the top five plays from the Cougars' thrilling 8-7 overtime win over the Eagles Tuesday. Watch: Palmyra-CD East top 5 playsSee the top five plays from the Cougars 19-0 win over the Panthers Tuesday. Lacrosse results from April 17Here are the April 17 lacrosse results that were reported to GameTimePA.com. Watch: Chambersburg Palmyra top 5 playsSee the top five plays as the Cougars held off the Trojans 16-15 Thursday.